The wealth of talent in Australia is mind boggling, and many of their best composers and musicians are unknown over here. Down under, David Stanhope is a leading conductor who "occasionally is able to find time to practise the piano". So, with total insouciance and complete aplomb, he recorded (on a Stuart & Sons instrument) music by Godowsky which Horovitz gave up upon, "hopeless, it needed six hands to play it". This interesting, but unquestionably controversial, disc makes a strong case for Godowsky, and puts to rest misunderstandings about his Chopin studies arrangements. Stanhope also plays Liszt's transcription of Beethoven's Symphony No 8, for which a conductor "is rarely able to give more than a routine performance" because of the vicissitudes of rehearsal time. The pianist "has much greater control" - - "one loses orchestral colour but gains subtlety". Whatever that situation away from the great metropoli (the plural is metropoli, metropoleis or metropolises!) do try to hear Stanhope and decide for yourself. Stanhope, from Australia, is a professional horn player and bass trombonist. So where does he get off playing the piano so well? Jealous? Me jealous? Okay, maybe a little. Stanhope moves through these difficult pieces with utter confidence. The repertory is interesting. Generally pianists choose the Bach-Busoni Toccata in C. This is one of the relatively few recordings of the wonderful Bach-Busoni E-flat P&F. Nor do many pianists feel up to the work involved with the Godowsky Chopin transcriptions, or the Liszt transcriptions of the Beethoven symphonies, not to mention the Godowsky Passacaglia, heard here, on the opening measures of Schubert's Unfinished. Stanhope's tempos in the Schubert are unusually fast, and I love them. All his playing is strong and impressive; a fine musical mind is at work. The recording, made at the University of Newcastle's concert hall, is clear and resonant. Take a deep breath: here is a towering athlete of the keyboard who tosses off the peaks of the virtuoso repertoire before breakfast, aided by a four-pedal Stuart piano. David Stanhope is an Australian composer, conductor, horn player and bass trombonist who 'occasionally finds time to practise the piano'. The irony of that last remark will not be lost when you hear him tackle some of the most formidable peaks of the virtuoso repertoire with an ease and grandeur that shame more celebrated pianists. He positively revels in Busoni's joyous and opulent arrangement of Bach's organ Prelude and Fugue in E flat and, enterprisingly prefacing his selection of Chopin-Godowsky Etudes with the originals (he plays all seven versions of Op 10 No 5), he spins off every intricacy with dazzling fluency. Matters are made even more intriguing by the use of a Stuart piano, complete with four pedals (the fourth, called a 'dolce' is put to admirable use in the Busoni), a shallow but attractive sound and a conveniently light action. Stanhope's delightfully haywire notes tell us that Godowsky's Passacaglia is 'easy', 'of extreme difficulty' and 'with only a few pages that are technically difficult', and Tall Poppies' sound is both immediate and refined. It is very heartening to see two new discs recorded on Australian-made Stuart pianos. While the good news is that Gerard Willems has just completed his marathon of recording all the Beethoven sonatas using Stuart pianos for ABC Classics, it is also good to hear other pieces played on the home product with other performers and recorded by other engineers. Stanhope’s disc is an altogether more serious affair [compared to Tedeschi’s]. The program says a great deal: Busoni’s arrangement of Bach’s E-nat Prelude and Fugue. Godowsky’s studies on Chopin’s Study Op. 10 No.5, his herculean Passacaglia and a Liszt transcription of Beethoven’s Eighth Symphony is a solid meal of heavy romanticism. Newcastle University’s instrument emerges triumphant and intact after this heavy workout. Stanhope’s heroic battle with the music impresses, but oh, for a few quiet moments! 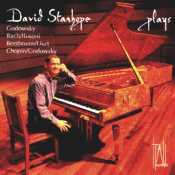 David Stanhope Plays (TP135) is my favourite – a program of transcriptions that are technically very demanding by musically substantial and rewarding. In addition to Busoni’s transcription of Bach’s Prelude and Fugue in E-flat, there are eight studies by Godowsky on Chopin’s Etudes. Of particular interest is Liszt’s transcription of Beethoven’s Symphony 8. Stanhope has technique to burn, a penetrating musical intelligence, and should be much more widely known. This disc is on Australia’s Tall Poppies label, which seems to be a connoisseuse-run labor of love and is well worth your support. David Stanhope is a conductor, composer, and sometime pianist. It seems a little counterintuitive that someone so obviously occupied with other matters would choose to record a disk of some of the heaviest knucklecrunchers in the repertoire. But make no mistake -- the performances are hardly those of a part-time pianist. This release features a recording on the fascinating Stuart piano, designed by Australian Wayne Stuart. The Stuart's timbre is immediately distinctive -- the sound is light, but satisfyingly full-bodied, giving an exemplary clarity to this densely detailed music. The disk opens with what may be one of the best performances of the Bach-Busoni St Anne ever recorded. Stanhope's performance has an exciting drive to it -- differentiating it from Demidenko's somewhat ponderous version -- but it never sounds rushed as Geoffrey Madge's does in his Dante release. The Stuart really suits this work; one hears, for example, the trills in the prelude that are often obscured. We then are indulged with a selection of Godowsky's Studies on the Chopin Etudes, each of which is prefaced with the Chopin original. These are rendered with style and aplomb and, once again, the piano sounds great. Following is the huge Godowsky Passacaglia. Stanhope, both in his performance and his notes, makes light of its fearsome reputation, breasting its big challenges and closing with weighty, sonorous chords. The disk closes with the Beethoven-Liszt Symphony No. 8. As Stanhope points out in his notes, conducting tradition often causes some of the tempi in this work to be a bit slack, especially in the first movement. He makes his point tellingly with a thrilling first movement, and backs up to do the same in the finale -- while missing none of the inner movements' wit or charm. This is a very enjoyable disk. I invite you to listen to it, and then call Tall Poppies and urge them to commission another disk from this fascinating musician. I wish David Stanhope were as well known as the man who bought the first of these monster pianos, Rowen Atkinson, a.k.a. Mr. Bean, alias Black Adder. This 2.9 meter, 97 key, four on the floor (pedals) aircraft carrier is the Stuart & Sons concert grand. Stanhope puts the mighty Stuart through its paces on this one. And mighty like a rose, not just power. These are difficult and lovely selections, rarely performed, all linked to more popular pieces; and yet genuine in their own right.